The study included a total of 412,946 patients identified from the National Inpatient Sample database with stage IV lung cancer who had been terminally hospitalized. “Aggressive medical care at the end of life for patients with cancer has not demonstrated a survival benefit and is associated with worse quality of life for patients,” write the authors of a study published in the American Society of Clinical Oncology. The authors of the study evaluated aggressive care at the end of life in patients with metastatic lung cancer, and concluded that aggressive care at the end of life is poor-quality care. The study included a total of 412,946 patients identified from the National Inpatient Sample database with stage IV lung cancer who had been terminally hospitalized between 1998 and 2014. The researchers used longitudinal analysis to determine trends in aggressive inpatient care at the end of life and multivariate logistic regression to determine associations with patient and hospital characteristics. From 1998 to 2014 the percentage of patients admitted to the intensive care unit (ICU) during terminal hospitalization increased from 13.3% to 27.9%. This increase in ICU visits resulted in a higher mean total cost of care. 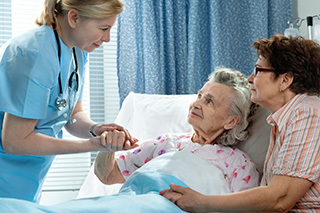 Notably, palliative care encounters for terminal hospitalization also increased during this period from 8.7% to 53.0%. While this was correlated with a decrease in aggressive care at the end of life, it did not offset the trend in increased ICU use. The authors estimate that the mean total costs for terminal hospitalization, adjusted for inflation increased from $14,000 to $19,500. This study, “compels the reader to further consider how comprehensive symptomatic care and treatment preference interventions for patients with lung cancer can be implemented to improve care and limit patients’ time away from home and in the hospital at the end of life,” conclude the authors.